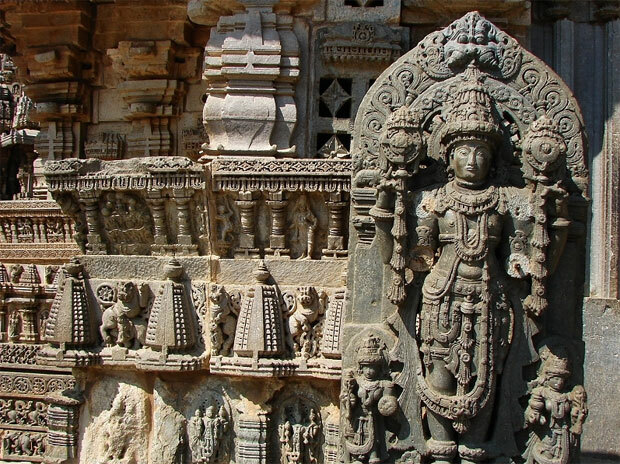 Famous for the star shaped 13th century Hoysala temple is of great architectural beauty with three temples named after Prasanna Chennakeshava. 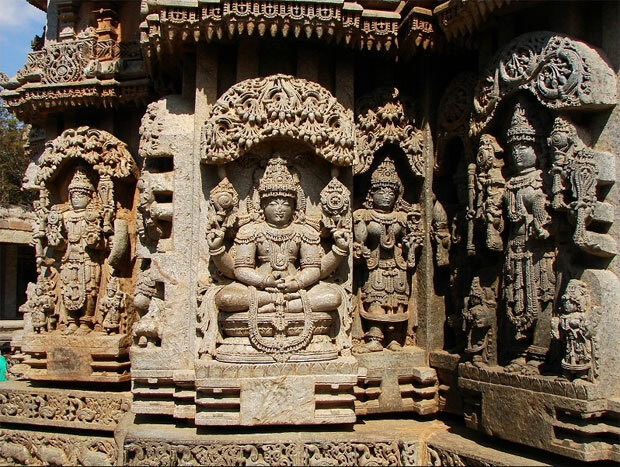 You can see stone carving work through out the temple walls and pillars. Somnathpur is located at a distance of 35 KM from Mysore. There are two ways to reach this place from Mysore (central place for the trip). First way is to come to a place called T.Narasipura (also called T.N.Pura which is a taluk head quarters and all facilities are available) which is 30Kms from Mysore and then proceeding towards Somnathpur which is only 9 Kms. The second route is to go via Bannur (24Kms from Mysore) and then reaching Somnathpur which is only 7 Kms from Bannur. 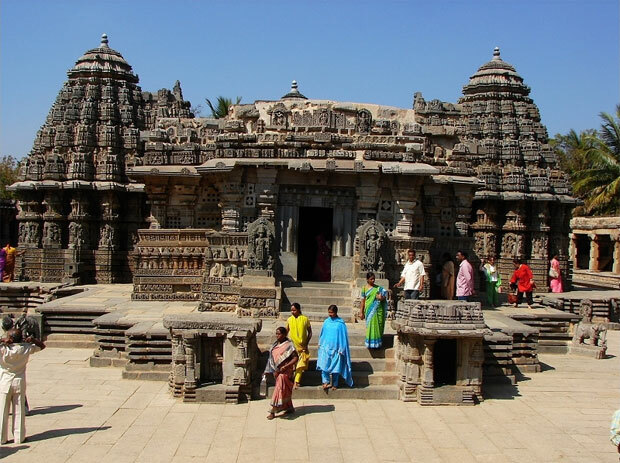 People visiting Somnathpur can also visit places called Mudukuthore (famous for Mallikarjuna temple), Talakad (famous for Vaidyanatheswara temple and other temples submerged in sand), Shivanasamudram (also called Bluff and Shimsa which is famous for Gaganachukku and Bharachukku water falls). Only bus transportation is available. Both Karnataka state government (KSRTC) and private buses are available. The total trip for Somanathapura, Thalakadu, Shivanasamudram and Mudukuthore can be booked either from Mysore or Bangalore at KSTDC (Karnataka State Tourism and Development Corporation). The best visiting time is from September to February as there will not be any rain and the various temples situated at Thalkad can be seen clearly. These temples are submerged in sand. The climate is moderate entire year. But, possible to visit and see during most of the time in the entire year. There are no good hotels and no accommodation facility available in this place. Resorts are available only in Mudukuthore place (26 Kms away) to stay. People can stay there is they are planning for the entire trip. These are to be booked at Bangalore KSTDC centre. Though there is not exclusive parking place surrounding the temple, the area outside the temple itself is used for the purpose. Parking charges (as on October 2008) is INR 30 for bus, INR 20 for tempo, INR 10 for LMVs, INR 5 for two wheelers. Still cameras can be used without any fee and restrictions. Video cameras can be used without stand by paying a nominal fee of INR 25. Entrance fee for Indian citizens is INR 5 and for foreigners it is INR 10. No entry fee for children. Temple Visiting timings is from 9.00 am to 5.30 pm. The place is purely village area. No good hotels are available. This place is not a shopping place. Normal practice of the trip is to visit Somanathapur temple (from Mysore) and then proceed to Mudukuthore and then to Talakadu. If one is interested to see the sun set in Talkadu, the trip can changed to proceed to Shivanasamudram from Somanathpur and then from Shivanasamudram to Thalakad. In the latter case, be sure to reach before 4.00pm as the temples at Thalkad cannot be seen. Visit the Picture gallery to view the other images this temple.